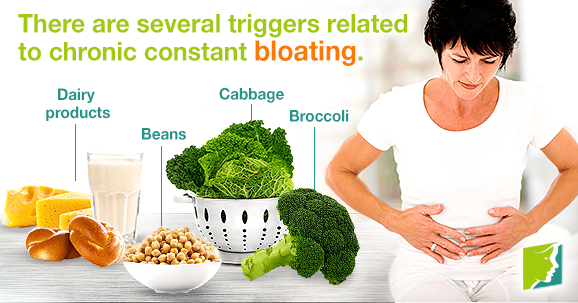 Chronic constant bloating can be extremely uncomfortable and even painful. There are many different triggers of chronic or constant bloating, and oftentimes it can be difficult to understand the cause of your discomfort. Some common causes include water retention, food allergies and intolerances, intestinal sensitivity, and foods that are high in fiber or high-fructose corn syrup. Keep reading to learn more about chronic constant bloating. Chronic constant bloating is a condition in which the abdomen feels uncomfortably full and gaseous, and may also be visibly swollen (distended). There are several things and triggers related to constant bloating. Chronic constant bloating may result from water retention due to hormonal changes. For women, water retention occurs most often during menopause and premenopause, usually in the weeks preceding their period. The best way to manage water retention and constant bloating is by engaging in regular exercise and eating a healthy, balanced diet with less salt. Frequent bloating is often caused by the formation and accumulation of gas in the digestive tract. It be caused by the food you eat. Many foods, such as beans, broccoli, cabbage, and cauliflower are high in fiber and therefore hard to digest. Fizzy drinks and other sugary foods may also lead to a buildup of gas and contribute to chronic bloating. Chronic bloating can be a result of food intolerances. In this case, the body is unable to properly digest some foods. The most common foods that the human body has trouble digesting include wheat and dairy products. If you experience chronic bloating after eating wheat or dairy, it may be indicative of gluten or lactose intolerance and you should avoid consuming those foods in great quantities. Constant bloating after eating may be indicative of a more serious condition, such as irritable bowel syndrome (IBS). People who suffer from IBS typically report minimal bloating in the morning and increased bloating in the evening, especially after meals. People with IBS usually experience abdominal pain and discomfort, as well as abnormal bowel movements. While the cause is not known, symptoms can often be managed with medication, changes in diet, and stress management. The risk factors for chronic constant bloating are not well defined. However, it has been found that women report a higher incidence and are at a greater risk of experiencing chronic, constant bloating, especially during menopause and premenopause. It is normal to experience occasional bloating as a result of diet changes, hormone changes, or stress. However, in those cases, bloating symptoms will usually subside within a few days. If chronic bloating symptoms persist or you experience a constant feeling of fullness, be sure to consult with a physician. It is important that you see a doctor as soon as possible if bloating is paired with severe stomach pain, rectal pain, heartburn, nausea, vomiting, diarrhea, or constipation. While there are many different causes of chronic constant bloating, this condition can typically be managed by lifestyle changes, especially in regards to diet, exercise, and stress management. However, it is important to take note of the possible triggers of chronic bloating in order to successfully identify the root problem and the best ways to manage it. For further information on chronic constant bloating during menopause and how it can be managed, click here.